In case you didn’t know, “Breaking Bad” is a pretty amazing show. And in case you did know, now we can tell you just how amazing – officially. The iconic AMC drama will feature in the upcoming GUINNESS WORLD RECORDS 2014 edition as the “ highest rated TV series,” thanks to its metascore of 99/100 on MetaCritic.com. To celebrate this achievement as the show heads for that giant cooking lab in the sky, we decided to pick some appropriate records for various characters from the program. Heisenberg approved. For a notoriously sinister and ruthlessly manipulative drug kingpin, Walter White sure does spend a lot of time in his tighty-whities. Which means Steve Jacobs (above) better watch out. Walter has always shown an affinity for respecting and then eliminating those he considers threats, and Jacobs owns the record for most underpants worn at once: 266 of them. Say his name. It's easy to forget that Jesse once had a life outside his alternating states of wallowing in despair and firecracker rage. In fact, he even played in a band! Maybe the best way to respect the spirit of TwaüghtHammër and dissipate all that passive-aggressive rage is to grab the sticks, pull up a stool, and take a crack at the longest marathon drumming, currently at 122 hr 25 min by Indonesia's Kunto Hartono. 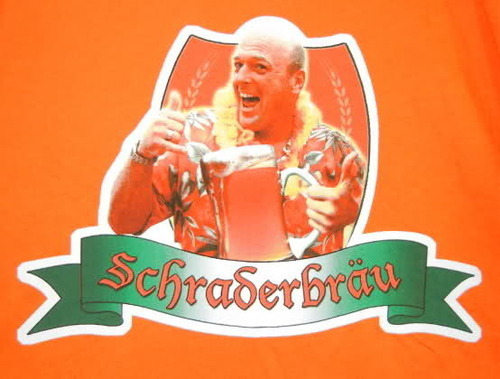 Who doesn't love an ice-cold Schraderbräu after a long day of tracking down your druglord brother-in-law? If Hank can somehow bust Walt and escape with his reputation (and life) intact by the end of the season, there might not be a better way to celebrate than by gathering all of the DEA and APD to enjoy some brews and beat the 322 people who set this record at The Oast House of Manchester (UK) in August. The pre-paid cell phone bills for everybody's favorite lawyer must be through the roof. There's a reason you " Better Call Saul." Ever notice the number of burners available in his top desk drawer at any given time? Impressive, sure, but still nothing on Germany's Carston Tews, who owns the largest collection of mobile phones with 1,563 different ones. By legitimate transactions or embezzled ones, Skyler is doing quite the job making the A-1 Car Wash the most lucrative in New Mexico's history. As her own competitive mean streak festers with each passing episode, we feel sorry for 89 of the Repco stores across Australia and New Zealand. It's only a matter of time before the White car wash empire takes out their record of 6,277 cars washed in a workday back in October. Sorry, we couldn't resist. There's no way Marie would come close to this record, instead blurting out "Purple!" time after time like an owl who isn't that wise. So rest easy, Sancy Suraj Singh (Singapore). Your 160-color sequence looks safe for now . Need we say more? Walt, Jr., would go cuckoo for Cocoa Puffs (see what we did there?) if he came across this 82-cm tall (2 ft 8 in) stack by Marc De Bruyckere, Kurt Dobbelaere, Michel De Pauw and Joeri Van den Bussche in Maldegem, Belgium. To our long-lost pollo hermano, we thought of the only record we could: the largest collection of chicken-related items. Cecil and Joann Dixon of the USA have spent more than 40 years collecting 6,505 chicken-related items. Although we're pretty sure that doesn't include any chicken man face masks. For more entertainment records from the biggest stars in Hollywood, be sure to check out the GUINNESS WORLD RECORDS 2014 edition. It will be the one who knocks, in stores Sept. 12. Visit www.guinnessworldrecords.com/2014 for all the details.